The Brett Brothers entered the bat business with the goal of ensuring that coaches at all levels of ballplayers have access to superior quality composite wood bats that are cost effective. Consistency and durability were the primary factors when establishing their bat designs. The Brett Brothers have been involved in the game their entire lives, through Bobby and John's Minor League careers to the Professional careers of Ken and George. The Brett Brothers know the game. Even today, it's an important part of their lives, with each brother being involved in their own way. George, who is still a part of the Kansas City Royals Organization and a hometown hero here in Kansas City, was a career .305 hitter with 3 Batting Titles, a 1985 World Series Ring and an induction to the Hall of Fame in 1999 to round out his 21 year career in Kansas City. Not only did he prove to be a consistent hitter he showed that he had the knowledge to succeed. The Brett Brothers understood that having reliable wood was an important component. This is why they implemented their 3-piece laminating system along with their patented BOA reinforcement handle. The all new Thunder model is uniquely designed with a bamboo core and a maple barrel. Brett Brothers: Get the very best in the game! Free Shipping. Pros: Great balance. Added control, especially when hitting down the lines. Pros: Great bat, has plenty of pop, I now know why they call it Thunder. In our league all three homeruns have been hit with that bat. Awesome bat!!! Pros: VEry easy to get the bat around. Nice finish. Nice craftsmanship with the two materials ( Maple and Bamboo )A nice bat for the price point. Cons: It could be a little heavier. Cons: Do not buy this bat. It is overrated and overpriced. . . spend the extra $40 and buy an X-Bat instead. The feel is hollow and the bat dents easily. Pros: Great bat has lots of pop. Use it in senior league and a lot of my team use it in place of their bat. They say the power it gives almost makes other think it is a metal bat. Plan to purchase another for me the others can use my older one. I am not muscular but since using this bat I am hitting the ball as far as the big guys. Best bat I ever had. It is not the team bat. Pros: Light with a lot of pop! Very sturdy, the fiberglass reinforcement has saved this bat many times when the ball hits the handle area. Huge sweat spot. The cupped end makes the weight of the bat very balanced from end to end. Pros: Ball jumps off the bat. Great for hitting line drives. Surprizing power for a bat that is so light. Pros: Solid bat. Team uses it for league play & practices. We are 3-0 thus far, scoring lots of runs, big hits with it. Pros: Good all around bat.The bat had a nice whip to it and decent pop. Cons: A little skinny at the top. Pros: Ball jumps off the bat. I've purchased three different wooden bats and this bat is by far the best of the three. Pros: Good Balance. Better than average pop off the bat. Descent sweet spot! Good bang for the buck. Cons: Barrel is pretty small. Pros: great bat with large sweet spot. Pros: Great bat! The ball just jumps off of the bat. Teammates have used it and love it too. I recommend this bat. Pros: Used the bats for only two games as our local season ended, but have had great results so far and our big hitters out performed our rival teams using regular wooden bats. Pros: Good weight, feels good to swing. Sleek. Teamamtes like the looks and feel. Cons: Would like to have had a 34 in a 27 oz weight rather than the 33. Pros: Great pop and reinforced handle for protection against breakage. added 20+ ft to my distance. Pros: Great bat for the price. It gives a bit more pop than a comparably priced BWP wood bat. I can hit hard liners to the outfield consistently. It's my favorite bat to use on our slow-pitch team. Cons: My teammates have complained of this bat stinging their hands. I only have experienced the stinging on bad swings. Pros: So far so good- has a nice sweet spot. Didn't give it 5 stars- because I only had a chance to use it a handful of times. Cons: hate markin up that pretty black finish.... hit away!!!!!! Pros: Great feel and balance. Great for the hitter that likes to control exactly where the ball is going. Some of the young kids on my softball team had never hit with wood. Now they have and they love the feel. Cons: Wanted to write a review and see what others thought. I bought this bat based on the reviews, and it turned out to be awful. Lots of sting in the handle, even when making solid contact. My team and I tried using it and could barely get the ball out of the infield. NO POP whatsoever. Based on the other reviews I assume it's defective and will be returning it. Should I by another one assuming my current is defective? Does anyone have any thoughts or advice? Does the wood have to loosen up at all? Pros: Great bat...lightweight and good feel to it. Shipping was extremely fast as well! Pros: For a wood bat the ball sure takes off. Used it for 2 games so far and no complaints yet. Cons: I swing a 28 oz composite bat so I went down an oz. to a 27 since wood usually seems heavy but this bat is very light wish I would have gone with the 28 oz. bat. Pros: Ball comes off quick. Nice line drive bat. Weight of 28 oz. Feels great. Handle should make this bat very durable. Pros: Great bat, I purchased this bat for a cold weather bat. Decided to use it this weekend in a tourney. great bat for base hits and control. Plus the sound of a wood bat really will get peoples attention. Cons: The ball won't go as far as a metal bat. Pros: Great pop my entire team is using it now. Pros: The look is very attractive. Didn't get to put it to the test yet, but I will post when I do. Seems like a good bat from the feel of it to the look. Cons: A little lighter than I thought it would be, being a wooden bat. Pros: Awsome bat solid line drives my team really like the bat so, I'll be ordering more. Cons: Feels like your hitting with a nerd bat. Not a lot of feel at contact. NEED HEAVIER THAN A 28 OZ!!! Pros: Light weight, which helps for smaller guys on my team like. Still has good pop. Cons: Haven't found a con yet. We actually bought a second one, just in case first one breaks. Pros: Nice feel to the bat and has some pop to it. Just about everybody on my team uses it. Cons: Haven't found any cons yet. Pros: Great pop with big sweet spot. I have never been a power hitter. Before I got this bat it was grounders or fly outs to left. Now I consistently put 2 or 3 over the fence every game. Definitely a game changer for me. Cons: Every guy on the team wants to use it. Pros: great feel and pop. ordered weight (33/27oz & 34/28oz) was spot on for both bats. played a wood bat tournament and both bats held up great with several teammates swinging both bats (with a few miss hits) through 5 games. found myself swinging the 27oz more as it felt quicker to get around. Cons: nothing bad to say please if u really want a bat that last long and has great balance and alot of pop im very happy. Pros: Great bat... I bought this bat because I wanted a bat for myself and that I could feel comfortable with. You know these bats just fit, sure they may sting a little but with a lil love and care and some wrap the sting just falls away...and not to mention everyone loves a new bat, since they want to be the first to splinter it! These things take a beating as well as deliver good solid hits all around even off the handle..whoops... Thanks and keep up the great work fellas! Cons: didn't buy more than one!!!! Pros: Good pop and swings nice. Used in a wood bat tourny and guys liked it. I wish we could switch over to these wood bats and get rid of the metal!! Cons: Some spots on the finish was messy but it not to bad. Cons: Would like option of more weight. Have a question about the Brett Bros. Thunder Bamboo/Maple Wood Slow Pitch Softball Bat: SST500 Black? Ask our team of experts and they will respond within 24 hours. Does the fiberglass reinforced handle actually decrease the chances of breaking compared to other wood bats? I'm a little too cautious when it comes to wood bats. The idea behind the fiberglass technology is to decrease the chances of the bat breaking, or prolonging the lifespan of the bat. However, when hitting with wood bats there is always the chance of a mishit which would result in the breaking or cracking of the bat. The grains will be tightest and strongest directly above or below the "Thunder" imprint on the barrel. is this a 2 1/2 inch barrel or a 2 1/4 inch? This particular model has a 2 1/4 Inch barrel size in diameter. Looking for a bat for a wooden bat tournament. With the fiberglass on the handle, does this qualify as a wood bat? Yes, the Thunders are considered wood bats. They are very popular bats. Is there any differenc between the Brett Bros' black, blue and red bats? There are no other colors available for these bats. Is there any warranty on this bat like the BamBoo Bat, or does this manufacturer not give one? There isn't a warranty on the bat. What's the difference between the yellow thunder bat that cost $69, and the other 3 thunder bats that cost $59? The Brett Bros. Thunder Bamboo/Maple Wood Softball Bat: SST500 Yellow Slow Pitch With FREE Energy Towel is Approved for Play in ASA, USSSA, NSA, ISA, and ISF. The other three Brett Bros. Thunder wood bats are only approved for ASA Play. IS THIS LEGAL FOR HIGH SCHOOL BASEBALL BECAUSE OF THE WEIGHT DIFFERENTIAL? The Brett Bros. Thunder Bamboo/Maple Wood Softball Bat: SST500 Black Slow Pitch is not a baseball bat. Since this is a softball bat, it will not be legal for high school baseball play. The Brett Bros. Thunder Bamboo/Maple Wood Softball Bat has a 2 1/4 inch barrel. What is the difference in power from wood to composite? How long do wood bats last? There is always a threat with any wood bats that they could break. The Brett Bros. Thunder Bamboo/Maple Wood Softball Bat does have a Bamboo core and a Maple barrel with the Patented "Boa" Fiberglass Reinforcement Handle. This bat should be more durable for a wood bat. If you're comparing the power from this Brett Bros. Thunder/Maple Wood Softball Bat to that of a composite material bat you would typically see better results right out of the wrapper. A composite barrel bat will out perform this bat in the long run as it get more broken in. The composite barrel bats tend to have a period of break-in of anywhere from 100-250 swings. While this Brett Bros. will show results in warm or cold weather from day one. 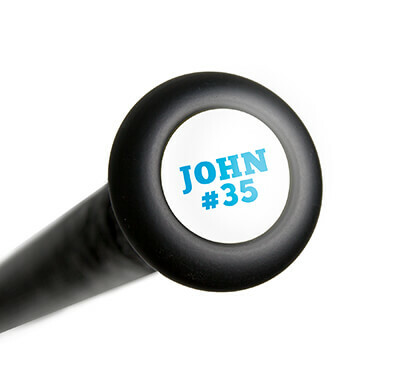 One customer review says this bat has a "Huge sweet spot." What is the difference between this bat and the Thunder 5? The Brett Bros. Thunder 5 Bamboo/Maple Wood Softball Bat: SBT34W is simply a newer version of the regular Thunder bats and the only difference is a different paint job/finish. What is your warranty for this bat? Due to the nature of wood, most wood bats do not come with a warranty, including the Brett Bros. Thunder Bamboo/Maple Wood Softball Bat: SST500 Black Slow Pitch. The bat is stamped ASA 2004 approved. Does that still apply in 2013, or is there new criteria? Slow pitch bats, like the Brett Bros. Thunder Bamboo/Maple Wood Softball Bat: SST500, that feature the ASA 2004 certification are currently still approved for ASA play. Bats with the new marks are being produced, but both marks are valid for ASA Slow Pitch leagues. Does it say official softball on it ? The Brett Bros. Thunder Bamboo/Maple Wood Softball Bat: SST500 Black Slow Pitch bats do have "Official Softball" listed on their barrels as well as the 2004 ASA certification mark. How does this bat work with the new .52 COR 300 balls that ASA has now gone to? The higher COR provides more of a "bouncy" feel off the bat. The Brett Bros. Thunder Bamboo/Maple Wood Softball Bat (SST500) would hit the balls about the same, but the balls wouldn't carry as well as the higher compression balls. Since this is a wood bat does it have a tendency to break like the old wooden bats? The Brett Bros. Thunder Bamboo/Maple Wood Softball Bat features a BOA fiberglass-reinforced handle which makes it much more durable than a traditional wood bat. How does this bat perform with soft-softballs? With the soft-softballs, sometimes it is better to use a wood bat. The Brett Bros. Thunder Bamboo/Maple Wood Softball Bat (SST500 Black Slow Pitch) would be a great option. The high quality bamboo and maple materials help provide excellent pop and durability. The Brett Bros. Thunder Bamboo/ Maple (SST500) does not come with a manufacturers warranty. I am looking for a good bat to use in a commercial batting cage that uses the dimpled balls, will this bat work for that? 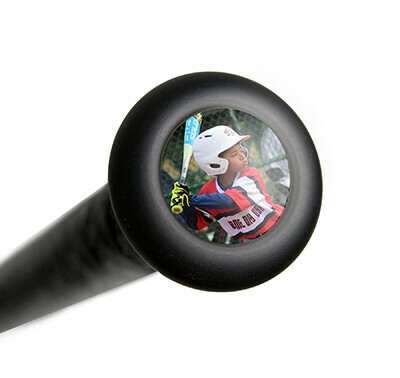 Yes, the Brett Bros. Thunder Bamboo/Maple Wood Slow Pitch Softball Bat (SST500) Black would be good the batting cages that use those dimpled balls. Does this bat get any hotter? Does it break-in and improve at all? Given the material that the Brett Bros. Thunder Bamboo/Maple Wood Slow Pitch Softball Bat (SST500) is made of, it would not benefit from a break-in process and will be as hot as you will see out of the wrapper. I am new to wood bats. I am 5 foot 7 and weigh 170 pounds. I am pretty muscular. What length and weight would I want? Based on height and weight, I would probably recommend the 33 inch size of the Brett Bros. Thunder Bamboo/Maple Wood Slow Pitch Softball Bat (SST500). Would this bat be any good for fastpitch softball (full windmill)? The Brett Bros. Thunder Bamboo/Maple Wood Slow Pitch Softball Bat (SST500) is more intended for slow pitch play and would probably be more likely to break facing higher pitching speeds. I have a 2004 Blue Thunder Maple Brett Bros softball bat. I was told it has bamboo in it and it is illegal for me to use in our senior league softball. It says "Maple" on it twice, is there another place the bamboo is integrated into it and not labeled? The Brett Bros. Thunder Bamboo/Maple Wood Slow Pitch Softball Bat (SST500) has a bamboo core. If you look in the end of the bat you can see the square area where the bamboo is running down the center of the bat. The bamboo material is also listed in the product title and product features. What weight does it come in? The Brett Bros. Thunder Bamboo/Maple Wood Slow Pitch Softball Bat: SST500 Black will still be featured in a 33 inch 27 ounce and 34 inch 28 ounce at JustBats.com. Can it be used for modified fast pitch? The Brett Bros. Thunder Bamboo/Maple Wood Slow Pitch Softball Bat: SST500 Black is intended for slow pitch softball and is not recommended for use in modified fastpitch. Is Brett Bros out of business? This was my bat of choice (SST500 Black). Now I can't find it anywhere. Brett Bros. is not out of business but there is limited options on their current bat lineup. There should be more options of their bats coming into the fold later this year (this is what we are anticipating). Does bat have BPF rating label? The Brett Bros. Thunder Bamboo/Maple Wood Slow Pitch Softball Bat: SST500 Black will feature the ASA stamp but there is no BPF stamp on the bat. I am not having any luck with this bat is it me or the bat? The Brett Bros. Thunder Bamboo/Maple Wood Slow Pitch Softball Bat: SST500 Black is a hybrid of bamboo and maple. It will create a very hard and durable model. Some players benefit more from a softer bat like birch or ash, and that may be worth exploring if you are having issues. This is my first year playing in the 55 and over. Is the Thunder bat a good bat to start with? The Brett Bros. Thunder Bamboo/Maple Wood Slow Pitch Softball Bat: SST500 Black would be a great option for 55 and over. The Pro Cupped end will allow for a great feel in the swing.